Monticello is beautiful after a new snow. 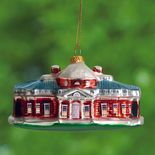 Our highly collectible snow globe is an accurate three dimensional view of the home of Thomas Jefferson. The semicircular globe sits on a faux wood resin base. The snow globe plays Mozart's Eline Kleine Nachtmusik, a song well known to Jefferson. 4 1/2" diameter, 5 1/4" high.